Repertoire is becoming more and more important in prog as many of the progenitors reach the end of their careers. There is still an audience for the music of the classic period - or later as in much of what was on display tonight - but having a member or two of the original band on hand adds the necessary caché to avoid the exercise turning into simply a tribute or lacklustre copy. Soon there will be a need to have groups of musicians who continue to play this music otherwise it will be lost to the live audience forever. And there are not many bands whose oeuvre is more important to prog - or indeed any other form of modern music - than King Crimson. Having lain dormant for almost a decade, other than a handful of live shows in the U.S. in 2008 (is it really over a decade since The Power To Believe? ), and with Robert Fripp having announced his retirement from the music industry in 2012, it appeared that the days of the King were over. 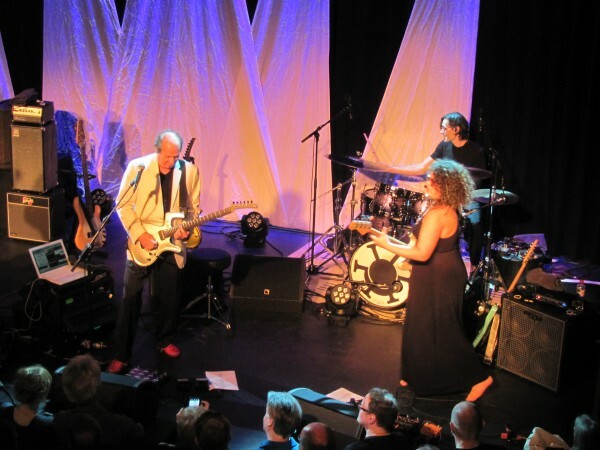 Despite Fripp's recent decision to reignite the KC flame with a new 7-piece band and live shows planned for the end of 2014, since 2011 the work of keeping the torch burning for much of the repertoire has fallen - with Fripp's approval - to The Crimson ProjeKCt, a sextet featuring former KC men Adrian Belew, Tony Levin and Pat Mastelotto (the latter pair set to appear with the new line-up of KC), together with the other members of their Stick Men and The Adrian Belew Power Trio bands; Markus Reuter (touch guitar), Julie Slick (bass) and Tobias Ralph (drums). And what a spectacular noise they make. Having missed the KC Double-Trio gigs in 1996 due to unavoidable circumstances (sight of the unused ticket for the show at this very venue in June of that year is still depressing! ), this opportunity to see a similar formation performing some of the same songs was a mouth-watering proposition. So here we are in the venue at last with a good sized and fully seated audience, a tangible sense of anticipation in the air. The Crim players clearly like this venue as it was here that I eventually managed to experience the beast live in 2000 on the last occasion that they played the U.K.. It was noticeable that there were a number of younger people in attendance, clearly not old enough to have seen the band before, which was great to see. Having expected the show to fall into three sections - Stick Men followed by the Belew Power Trio with the full Crimson ProjeKCt set as finale - the evening panned out very differently and the change made it far more interesting too. Shortly after 8, Markus Reuter emerged alone to play soundscapes on Touch Guitar that filled the hall with ethereal sounds. From my seat in the Level One balcony the sound was great from the start and throughout the entire show; not too loud but intense enough and with the necessary clarity to display the music in all its glory. Soon, Markus was joined by Pat Mastelotto and shortly afterwards by Tobias Ralph as the two drummers worked through a fascinating B'Boom, the drum duet laying the foundation for a lot of what was to lie ahead. The interplay between the two was wonderful and they work particularly well as a unit. 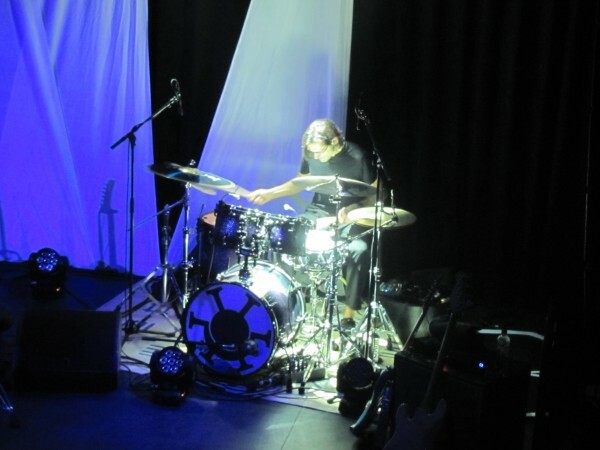 Pat is one of the best textural drummers I can think of and he adds hugely to the sound via his electronics and effects but his playing is just so considered and perfect for whatever setting he finds himself in. This was evident when I saw him play with The Flower Kings in 2007; the music was taken to all sorts of new and interesting places. Tobias Ralph is a very different player, a much smaller kit to work with but he uses it with precision adding rolls around the kit that complement Pat's playing to great effect. Having not seen him before I was immediately impressed by his unfussy style and attention to detail, a calm and reliable presence that drove the rhythms with flair. As B'Boom comes to a close the rest of the band emerge to huge applause and the structure of the evening is set; players swapping in and out, breaking into their basic trios and other formations to present the pieces to best advantage. This certainly aided the flow of the set which moved through the different musical styles and feels with ease, holding the attention throughout. All dressed in black, the ABPT were positioned stage left, the Stick Men set-up stage right so you got the weird scenario of half the gig only utilising half the stage but this also gave a more intimate feel to large sections, each of the integral trios (and other permutations) keeping to their own side of the stage but utilising it to the full and playing off each other as they would in a small hall. This increased the impact of the full unit's wide-screen power when they took up all of the available stage. The metallic onslaught of THRAK was a great way to introduce the power of the full CP band and they made the most of it with the crunching "verse" giving way to an improvised mid-section, Belew setting about his guitar with a power drill to get the desired effect. The tongue-in-cheek Dinosaur continued the Double-Trio theme but with more melody and a wonderfully executed false ending. A couple of tracks from the '80s KC next with the interlocking guitars of Frame by Frame beautifully realised with Reuter's Touch Guitar taking on the Fripp parts, meshing to perfection with Belew. 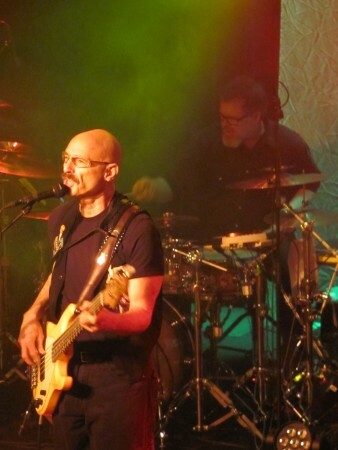 Tony Levin donned his "Funk Fingers" to come to the fore with the iconic bass part for Sleepless as the band thundered through this first mini-set. Levin is an extraordinary presence, the scope of his massive experience always shining through in his playing. Any criticism would be nothing short of nit-picking and the only thing that occurred to me was that despite Reuter playing all the Fripp notes with pin-point accuracy I feel that if the owl-like guitarist had been on the stage peering out of the gloom he would have played them with a little more edge and menace. This in no way undermines what Reuter brings to the evening, a player of immense talent and poise and a key part of the proceedings throughout. 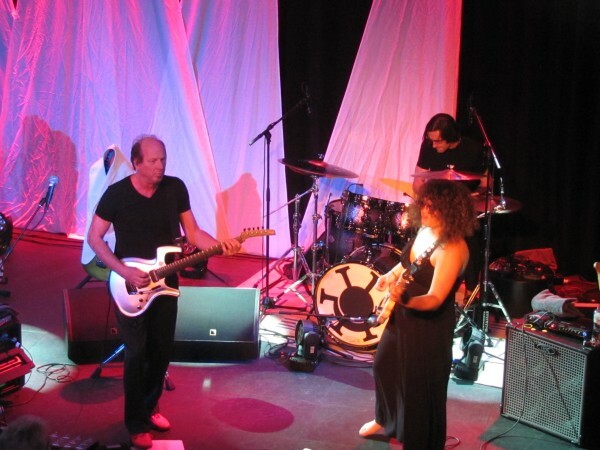 At first Julie Slick appeared to be filling in some of the spaces around Levin's playing but she certainly came into her own when Levin, Mastelotto and Reuter left the stage to allow Adrian's Power Trio to play on their own. Barefooted and flailing away as if her life depended upon it, Julie added bounce and energy to the ABPT as they gave their all with b, one of the standout tracks from their e album, before a rip-roaring chase through Neurotica from KC's Beat album, Ade's chattering vocals presented taped so that he could concentrate on his guitar, picking up the live vocals for the choruses. This track really showed the passion that the ABPT have for their source material and for each other, the piece completed at breakneck pace, Tobias nailing down the thundering race for the finish. This is a track that has grown in stature for me over the years and it was wonderful to hear it done so perfectly. 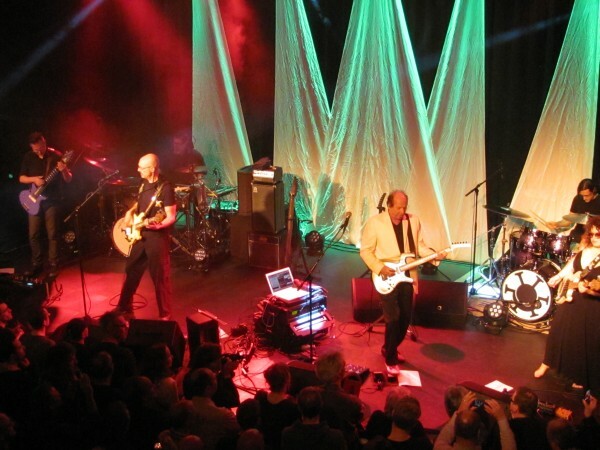 Next up Stick Men get their chance to shine, which they do with Crack in the Sky and Cusp from their Deep album. 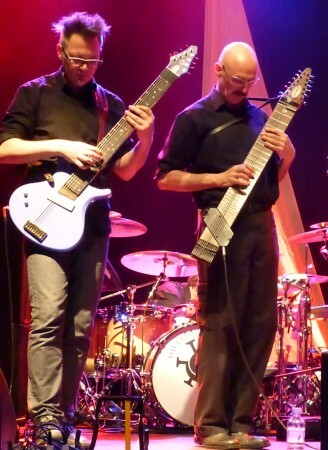 Tony and Markus weave around each other with Chapman Stick and Touch Guitar, Pat, as ever, the perfect foil. Compared with ABPT, Stick Men are more considered in their approach but no less fiery as they prove during a thundering run through of Larks' Tongues in Aspic, Part Two with Belew emerging for the solo, the piece finishing in a quartet format. Reuter then departs for the remaining trio of King Crimson members to give an exquisite run through of Three of a Perfect Pair from the album of the same name, the fluidity of movement amongst the players working to perfection. Another personnel change sees Pat head off for a slice of orange as Adrian and T-Lev play a lovely version of Matte Kudasai as a duo for only the second time, Belew complementing Tony on how much he adds to the song in this format. Levin is exchanged for Slick and Ralph as The Power Trio swing through the wonderful title track from e followed by the second Stick Men set. They start with a perfectly pitched improvisation that in no way outstays its welcome followed by a full-on hammer through Vroom Vroom and end with their inspiring five-part interpretation of Igor Stravinsky's The Firebird Suite. The depth and breadth of the material and the playing on display throughout the evening is simply breathtaking and this gig has become something wonderful; a celebration of the work of one of the most important and influential bands ever but also a fantastic performance by a group of like-minded individuals who are a perfect fit at a unit. Between them they cover an awful lot of bases and the switching around in the line-up keeps the audience enthralled. Heading for the line now, the full band give us the beautiful and slow-burning One Time from THRAK followed by the classic Red - performed with passion and aggression, exactly as it should be - before topping the set off with the best version of Indiscipline I've ever heard. The Doule-Trio really comes into it's own here; a drum duel between Ralph and Mastelotto, each supported during their part by their own team's bass player - Slick and Levin respectively. The differing styles in both the drumming - complete with Mastelotto's squeaky animal and laugh box response to one of Ralph's contributions! 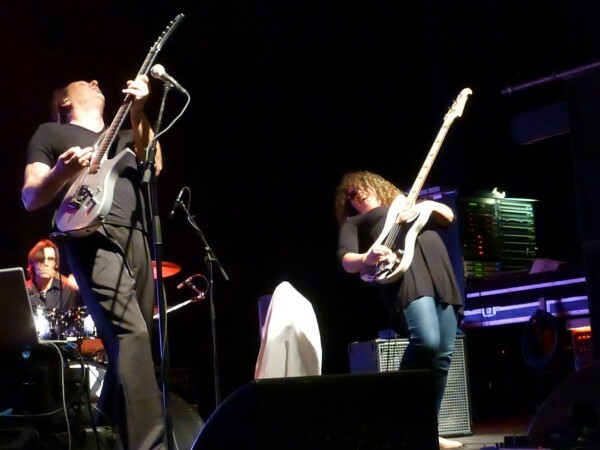 - and the supporting bass work made for a stunning build up of tension into Belew's tour de force vocals on one of the most original songs out there. He completely captured the edginess of the piece and went to town on making it his own. A fantastic way to finish. 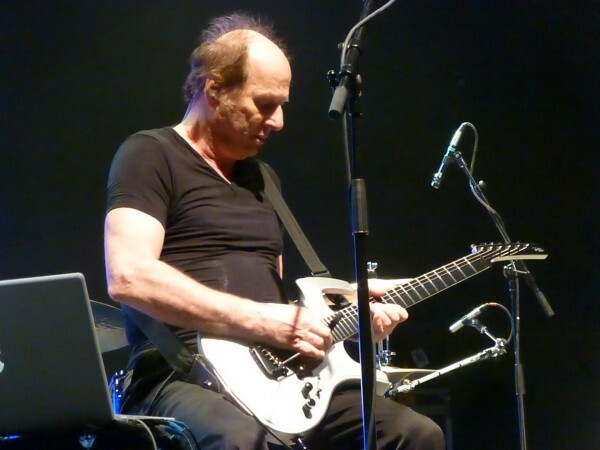 Let's just remember that Adrian Belew is 64 years old. All night he'd bounced around displaying otherworldly technique and a unique way of doing things, all with a huge grin on his face like a cheeky schoolboy. Cap that off with the fact that his voice is immaculate and his playing completely beyond any shadow of reproach and there you have the star of a particularly sparkling evening. The man is just extraordinary and what he can do amazes without him seeming to be trying too hard; it all comes across as effortless. I bumped into Matt Stevens after the show and he was quick to label Belew "The Best" at what he does, and who am I to argue with that. Unsurprisingly there were encores; a funky and flashing Elephant Talk with a second return for a thumping rampage through Thela Hun Ginjeet complete with Belew's recorded description of the event that inspired the piece just down the road in Notting Hill Gate all those years ago. After events in a certain other London theatre of the same vintage not too long ago it might be inappropriate to say that they took the roof off the Empire tonight, but when utilising metaphors it's safe to say that that's exactly what they did. The whole evening was captivating, just superb and another gig worthy of the long journey to London. 2014 is shaping up to be the Year of King Crimson and many of us are on tenterhooks at the thought of what Robert Fripp may have in store for us but tonight was the perfect celebration of the mid-period of Crimson's existence and for that we should all be grateful. It was a glorious sunny day. Hal and his family had quickly intercepted their new neighbours upon their arrival to the street, so as to prevent other residents from spreading vicious gossip about their often dysfunctional lifestyle. However, as his wife and sons quickly found themselves falling out with the new family, Hal had found a lot in common with the other father, Mike, who invited him over to his garage to look for briquettes for the barbecue. As the lights turned on, Hal found himself in a world of wonder. Looking around and gasping, he saw a giant television with surround sound, comfy armchairs, guitars and amps and rows of baseball memorabilia. It was the bachelor pad he'd never had. "Is this heaven?" he timidly asked. Turning around, he spied cases of vinyls. "Wow, look at this collection," he uttered, and began to pour through the sleeves. Picking up a few that he approved of, he remarked "Oh, Doobie Brothers!" and, stopping briefly on a bright red sleeve, "King Crimson!" I was struck by the coincidence. Though knowing I was in for a night of Crimsoid music myself, I was unaware that I'd be hearing the first five tracks from that very album. After finishing the episode of Malcolm in the Middle I'd been watching, I prepared for another cycle ride to the venue where I had seen the now famous Synaesthesia perform their debut gig only three months before. Learning from previous mistakes, I left myself plenty of time to get to the venue in time for doors opening. Continuing what is now a rich tradition of listening to Canterbury scene music on my way to the Boerderij, I polished off Hatfield and the North's debut on my journey. The smell of cow manure followed me all the way. Unfortunately, the smell didn't improve once I was inside the venue. In fact, it smelled more like an actual boerderij. In keeping with the Canterbury music I'd just listened to, it was only fitting that once inside I heard the second part of National Health's timeless The Bryden 2-Step (For Amphibians) playing through the speakers. Like the night before in Tilburg, I had been issued a photo pass, but this time it seemed without value, as there was no barrier between the stage and the audience for me to take advantage of. After fetching a beer (once again, learning from mistakes) I eventually found myself standing in precisely the same spot on the balcony where I had been situated during the Synaesthesia concert. 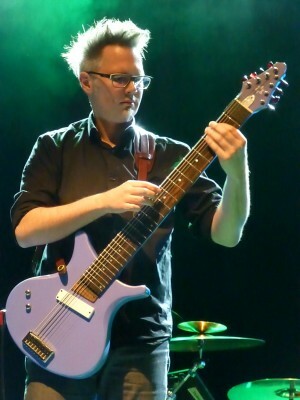 The Dutch aren't known for their manners; as Markus Reuter walked silently on stage and started plucking at his guitar, it was a full minute before the chatter died down, only after plenty of shushing. While the lip smacking continued, Reuter had initiated those who were actually listening on an eerie musical sojourn. 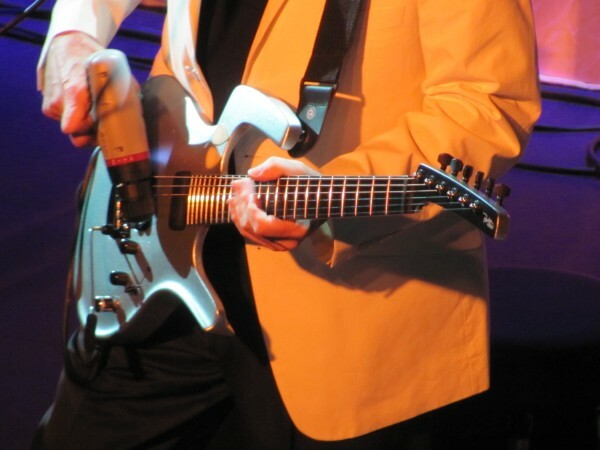 Using clever pedal techniques, he would time it so that no sound would actually emerge from his guitar when he plucked it. Almost as if the sound were moving in slow motion, the whine of the guitar would ring out several seconds after it was played. 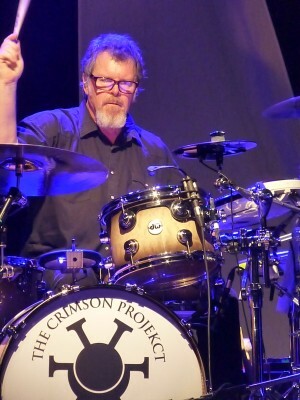 Soon after, he was joined by the pair of drummers, Pat Mastelotto and Tobias Ralph, who together formed a furious pair. If one thing kept my attention all evening, it was the world class drumming that was on show this evening. Mastelotto would often keep things bold but simple, while the dextrous Ralph experimented with increasingly difficult patterns. When the full band emerged, they were received with rapturous applause. 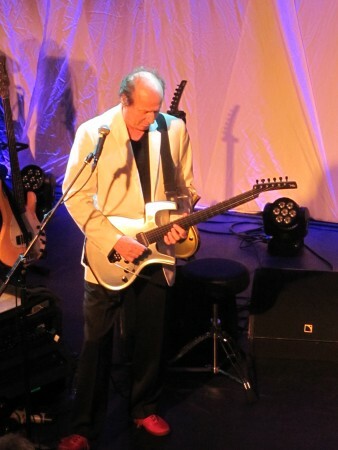 Standing in the middle of it all, Adrian Belew looked as genial and ready to play as ever. 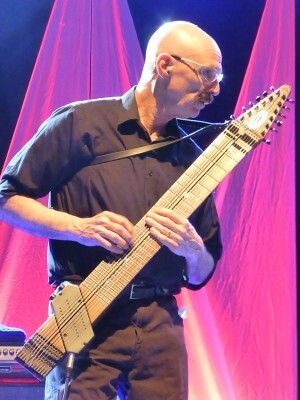 Tony Levin on the other hand, though smiling, tended to remain hunched over his instrument, which made taking a good photo of him rather difficult. Honestly, they shouldn't have issued me with that photo pass. Supporting bassist Julie Slick just looked happy to be there and seemed fully immersed in the music she was playing. Together, they all began playing THRAK, a sizeable portion of which is freely improvised. Standing there watching the musicians feed off each other's playing in a cumulative effort was strangely satisfying. This was something the audience wasn't often witness to: the making of music on stage, almost like an experiment, rather than just a pre-planned show. It was also defiantly 'unsafe' which gave me the smug satisfaction of believing I was listening to 'real' music, rather than just commercialised pap. It was a brilliant way to begin what was to be a wildly uneven concert. Don't get me wrong, it was consistently forward thinking and progressive, with a higher volume of quality music than many other concerts I've been to. However, each track seemed to take a wildly different direction to the last, which isn't surprising, given the sheer frequency of line-up changes that evening, as well as the large breadth of source material, ranging from King Crimson's Lark's Tongues in Aspic (which none of the band members originally played) to Robert Fripp's only solo album to Adrian Belew's latest Power Trio material. There was a method in the madness though. The music of King Crimson has always been dramatically shifting, something this concert clearly represented. An advantage of this was that if one track wasn't to your liking, there was always hope that the next might be better. Naturally, the Crimson material always came out on top, and none more so than the superb rendition of Indiscipline that the band chose to conclude the set. From what I'd heard on the band's live album, I knew what to expect, but seeing it live truly brought it to life. Once again, the band hugely extended the intro section in what appeared to be a drum duel. The bass pattern would alternate between Levin and Slick; when Levin was playing, Mastelotto would drum. After a few bars Slick would take over and Ralph would begin beating the skins. Seeing this kind of interplay really allowed the audience to analyse the drummer's styles, as they challenged each other to play more and more difficult patterns. It was a sight to behold. I'm not sure if I had the wrong idea wishing that the concert would end with 21st Century Schizoid Man, but as King Crimson's most iconic track, it seemed the best place to perform it. Sadly it wasn't to be, but the band did play great versions of Elephant Talk and Thela Hun Ginjeet to send us off. 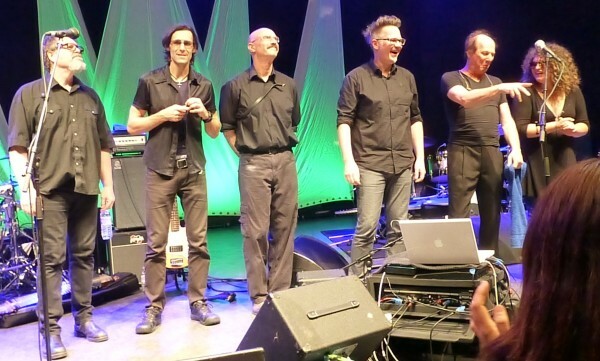 As a concert, this was a musical education, introducing the audience to the King Crimson way of thinking. I like it!